Mumbai, July 25 (IANS) Erasing morning gains, the Indian equity markets on Tuesday closed on a flat note with marginal losses as investors booked profits. However, both the NSE Nifty and the BSE Sensex scaled fresh highs during intra-day trade. According to market observers, the key equity indices were lifted on expectations of healthy quarterly results, coupled with hopes of a lending rate cut by the Reserve Bank of India (RBI) in its next policy review, inflows of foreign funds and consistent projection of healthy economic growth. Nevertheless, caution prevailed in the global markets ahead of the two-day US Federal Open Market Committee (FOMC) meet to be held later in the evening. The wider Nifty of the National Stock Exchange (NSE) fell by 1.85 points or 0.02 per cent to close at 9,964.55 points. The Nifty, which breached the 10,000-point level during the day’s early trade (at 9.15 a.m.) just after the pre-open session, touched a fresh high of 10,011.30 points during intra-day trade. The 30-scrip Sensitive Index (Sensex) of the BSE, which opened at 32,350.71 points, closed at 32,228.27 points — down 17.60 points or 0.05 per cent — from its previous close at 32,245.87 points. The Sensex also touched a record high of 32,374.30 points during the intra-day trade. The BSE market breadth was bearish with 1,492 declines and 1,200 advances. In terms of the broader markets, the BSE mid-cap index rose by 0.57 per cent and the small-cap index by 0.12 per cent. “Markets ended marginally lower on Tuesday after a positive morning session that saw the Nifty crossing the 10,000-point level. The Nifty, however, closed the session below the historic 10,000 mark,” Deepak Jasani, Head of Retail Research, HDFC Securities, told IANS. “Market sentiment was dull amid lackluster trading on the European and Asian bourses and subdued closing on the Wall Street overnight. Caution ahead of the two-day US Fed meet prevailed in the markets,” Jasani added. On the currency front, the rupee weakened by four paise to 64.38-39 to a US dollar from its previous close at 64.34-35. In investments, provisional data with the exchanges showed that foreign institutional investors (FIIs) purchased scrips worth Rs 270.77 crore, while domestic institutional investors (DIIs) sold stocks worth Rs 209.50 crore. According to Dhruv Desai, Director and Chief Operating Officer of Tradebulls, the global peers traded mixed as investors awaited the Federal Reserve meeting, to start later in the evening, for clues on the timing of its next policy tightening. “Stocks closed little changed as some investors booked profit after the NSE Nifty 50 Index briefly breached the record 10,000 mark buoyed by better-than-expected earnings,” said Desai. 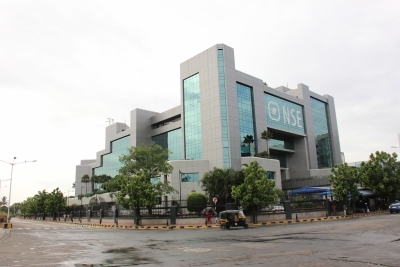 Sector-wise, the S&P BSE automobile index fell by 99.62 points, the capital goods index by 90.28 points and the healthcare index by 48.96 points. On the other hand, the S&P BSE metal index rose by 173.25 points, the banking index by 122.36 points, and the consumer durables index by 55.23 points. Major Sensex gainers on Tuesday were: Axis Bank, up 1.94 per cent at Rs 544.65; Bharti Airtel, up 1.76 per cent at Rs 427.60; Tata Consultancy Services, up 1.50 per cent at Rs 2,570.65; Tata Steel, up 1.03 per cent at Rs 553.10; and Adani Ports, up 0.68 per cent at Rs 389.85. Major Sensex losers were: Lupin, down 1.96 per cent at Rs 1,120.25; Tata Motors (DVR), down 1.79 per cent at Rs 269.05; Tata Motors, down 1.61 per cent at Rs 456.15; Coal India, down 1.07 per cent at Rs 258.55; and Sun Pharma, down 0.81 per cent at Rs 566.65.